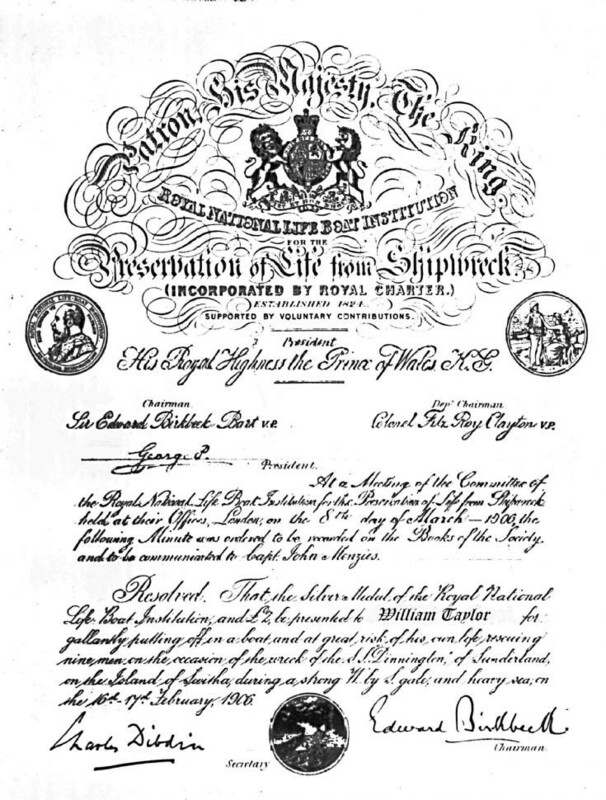 This is a copy of the RNLI certificate presented to William Taylor following the rescue of the crew of the SS Dinnington, wrecked on Switha in Feb 1906. The medal which was presented with this certificate is currently displayed at the Longhope lifeboat museum. This is an extract from the Orkney Herald. 21st Feb. 1906. The Dinnington, coming through the Pentland Firth in stormy weather with heavy snow showers was flooded so frequently that the Captain considered it advisable to put into Longhope. Drawing near the entrance between Cantick Hd and Switha, and an exceptionally heavy snow shower coming on, the navigation through the entrance became difficult if not impossible, with the result that the vessel struck heavily on the reef running out from the west end of Switha. Only a few minutes elapsed before the fore part of the ship broke off, while heavy seas were dashing over her. Instant action was imperative; and the lifeboat became freed by the surging of the ship and the action of the waves, rather than by the men, who, needless to say, did their utmost to save their lives .it is believed that about this time, with the breaking of the ship and the tempestuous seas running, the chief engineer, George Boyd, 25 Fawcett Street, South Shields, and William Templeman, AB, Brechin, Forfarshire, lost their lives. The remainder of the crew had no sooner got into the boat than she was upset, but fortunately, between hanging to the boat, and their own efforts one with another, after the greatest difficulty and no small danger, as well as injury, they all got to the land [Switha]. Many of the crew being partially dressed; and there being practically no place to shelter on the island, they spent a most trying time. But there were smart men who saw the lights of the ship, although unable from South Walls to know the facts in the darkness. Those brave-hearted men launched their boat; and in such heavy weather bore down toward s the wreck. Unable to approach, they searched in different directions; but could find no signs of life. Thinking the crew might have run before the wind to Flotta, they bore down for that place, but found none of them there. Desirous of doing their duty, this same crew lost no time, but set sail, still in the darkness of the night, for Switha again; hoping they might be the means of saving some human lives from the pitiless storm. Most fortunately they found the nine men huddled together for protection in a creek, and so by their timely arrival were the means of rescuing valuable human lives from death by exposure and fatigue. William Taylor, William Groat, Edward Jamieson, Bremner Taylor, William Cheyne and Daniel Fiddler. Surely deeds of this nature deserve worthy recognition! The saved crew of the steamer. who were in a most pitiable condition, were carefully taken into the boat, and were landed at Flotta, where they are being attended to. As many of the steamers crew were but partially dressed- one having practically no clothes, and he certainly would have perished, as well as several others, but for this prompt aid- they were in dire need of clothing and attention, which was bestowed by Mrs Simpson, while others including the Rev Mr Mitchell, who abounds deeds of charity, supplied clothing, and otherwise gave their willing aid. William James Muir, captain; Wm. M’Comba, mate; William Lane, second engineer; Alexander Gunn, A B; William Good, steward; George Herr, fireman; George Rottgart, fireman; Gust Samuel, donkey- man. They are being forwarded to their destinations through the hon. Agent of the Shipwrecked Mariners Society, who is Rev Mr Mitchell. The after part of the ship seems fixed on the rock meanwhile, but should the sea rise, It is likely soon to disappear. The bodies of the drowned men have been found not far from the wreck, and have been taken to Flotta, awaiting instructions for interment. The Dinnington was a vessel of 225 tons net register, and 366 gross, and was built at Newcastle in 1873. She belonged to Messrs Cuthbert & Wilkinson, Sutherland.